Important: as Blender 2.8 is still in development the following may be subject to change. For Blender 2.8 the previously available Tool Shelf buttons Flip Direction and Recalculate, typically used to fix inverted or incorrectly orientated surfaces that made meshes appear to be inside-out, have been moved to the main Mesh menu upper-left of the 3D View. As this is context sensitive it only appears in Edit Mode when editing mesh objects. Design note: the Mesh menu is context-sensitive to Edit Mode and mesh editing rather than element selection – the menu and option appears regardless of any faces being selected in the 3D View. To access the option and/or correct an inverted or inside-out face, first select the errant mesh element in the 3D View (Edit Mode selection) then from the Mesh menu click Normals then Flip Normals from the options that appear – Mesh » Normals » Flip Normals. The selected face/s will invert based on their current orientation. Design note: when selecting errant faces using vertices or edges make sure all component elements are included to the degree that the inverted faces highlight. The option to flip or invert faces  is now an Edit Mode option only (accessible only when editing meshes), click Mesh » Normals » Flip Normals  with an individual face or group selected. To fix inverted faces, or meshes that appear inside-out, in Edit Mode use the Flip Normals feature available in the Normals submenu – Mesh » Normals » Flip Normals. Alternatively to force individual faces or a selection to orientate inwards or outwards regardless of their current facing direction (inwards or outwards), use the Recalculate Inside (Shift+Ctrl+N) and/or Recalculate Outside (Shift+N) options, again from the Mesh menu; in Edit Mode select the entire mesh, A, then click Mesh » Normals » Recalculate Inside to flip faces/selections inwards or Mesh » Normals » Recalculate Outside to invert selections. Design note: in previous versions of Blender the Tool Shelf option, Recalculate, had a selection and results bias, faces tended to orientate themselves depending on the predominance of inwards or outwards facing surfaces prior to use. 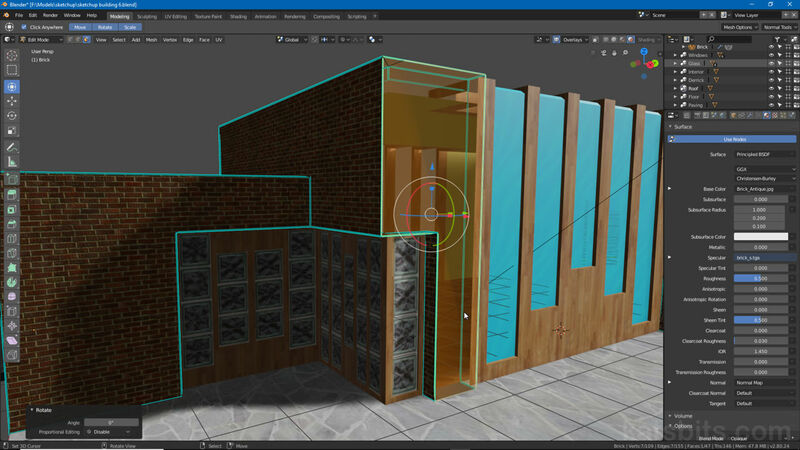 The two distinct options available in Blender 2.8, Recalculate Inwards and Recalculate Outwards, eliminates the oft’ random nature of the tool, fixing the outcome to be one or the other based on menu choice instead of element selection. For instances where surfaces are randomly facing one way or the other , or there are too many to select and manually process, use Recalculate Inwards/Outwards  to force everything to face the same direction, in or out, regardless – make a selection (individual, group or all) then click the Mesh menu, Normals then Recalculate Inwards/Outwards. When a mesh contains many inverted faces their orientation can be forced to face inwards or outwards using the Recalculate Inside and Recalculate Outside options also available under the Normals submenu – select all the errant faces (or everything) and click Mesh » Normals » Recalculate Inside/Outside. Notice: text is translated automatically and may include grammatical errors as a result.